A tourist from Beijing poses for a photo among little ‘Einheitsmännchen’ (roughly translating into ‘German Unity figures’), created by concept artist Ottmar Hörl and inspired by the symbol shown on pedestrian signals in former East Germany. 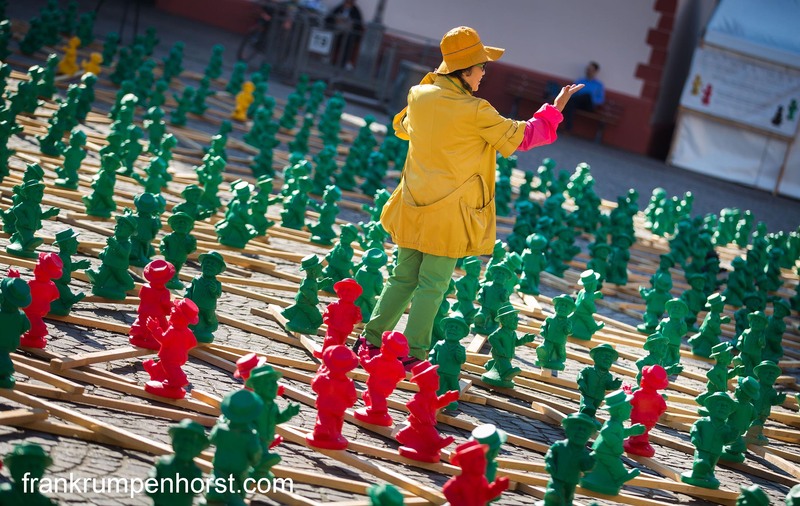 More than 1,000 little green, black, red and yellow plastic figures will be on display until 27 September as the city prepares for the national celebration of the 25th anniversary of Germany’s unification. This entry was posted in 1.4 50mm art, germany, Photo, Photography, serial and tagged art, china, concept, einheit, einheitsmännchen, ottmar hörl, serial, topurist, unification, unity. Bookmark the permalink. Tolles Foto. Stehen die Figuren auf dem Römerberg?